Both folic acid and vitamin B-12 participate in the synthesis of DNA and RNA. Folic acid supplementation clearly has significant public health implications. This article explores the mechanisms and manifestations behind folate deficiency, as well as its ramifications with regard to health and disease at large. Folic acid is composed of a pterin ring connected to p-aminobenzoic acid (PABA) and conjugated with one or more glutamate residues. It is distributed widely in green leafy vegetables, citrus fruits, and animal products. Humans do not generate folate endogenously because they cannot synthesize PABA, nor can they conjugate the first glutamate. Folates are present in natural foods and tissues as polyglutamates because these forms serve to keep the folates within cells. In plasma and urine, they are found as monoglutamates because this is the only form that can be transported across membranes. Enzymes in the lumen of the small intestine convert the polyglutamate form to the monoglutamate form of the folate, which is absorbed in the proximal jejunum via both active and passive transport. Within the plasma, folate is present, mostly in the 5-methyltetrahydrofolate (5-methyl THFA) form, and is loosely associated with plasma albumin in circulation. The 5-methyl THFA enters the cell via a diverse range of folate transporters with differing affinities and mechanisms (ie, adenosine triphosphate [ATP]–dependent H+ cotransporter or anion exchanger). Once inside, 5-methyl THFA may be demethylated to THFA, the active form participating in folate-dependent enzymatic reactions. Cobalamin (B-12) is required in this conversion, and in its absence, folate is "trapped" as 5-methyl THFA. From then on, folate no longer is able to participate in its metabolic pathways, and megaloblastic anemia results. Large doses of supplemental folate can bypass the folate trap, and megaloblastic anemia will not occur. However, the neurologic/psychiatric abnormalities associated with B-12 deficiency ensue progressively. The biologically active form of folic acid is tetrahydrofolic acid (THFA), which is derived by the 2-step reduction of folate involving dihydrofolate reductase. THFA plays a key role in the transfer of 1-carbon units (such as methyl, methylene, and formyl groups) to the essential substrates involved in the synthesis of DNA, RNA, and proteins. 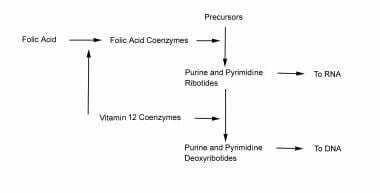 More specifically, THFA is involved with the enzymatic reactions necessary to synthesis of purine, thymidine, and amino acid. Manifestations of folate deficiency thereafter, not surprisingly, would involve impairment of cell division, accumulation of possibly toxic metabolites such as homocysteine, and impairment of methylation reactions involved in the regulation of gene expression, thus increasing neoplastic risks. The current standard of practice is that serum folate levels less than 3 ng/mL and a red blood cell (RBC) folate level less than 140 ng/mL puts an individual at high risk of folate deficiency. The RBC folate level generally indicates folate stored in the body, whereas the serum folate level tends to reflect acute changes in folate intake. Data from the National Health and Nutrition Examination Survey (NHANES) 1999-2000 indicate the prevalence of low serum folate concentrations (< 6.8 nmol/L) decreased from 16% before folic acid fortification to 0.5% after folic acid fortification. In elderly persons, the prevalence of high serum folate concentrations (>45.3 nmol/L) increased from 7% before fortification to 38% after fortification. Subsequent to the initial NHANES studies, subjects in the 2003-2006 cohort were asked about their daily supplement use in order to better quantify their total daily intake of folic acid. It was discovered that 34.5% of the participants took supplements containing folic acid. Certain groups were over-supplementing, while other groups were still receiving inadequate doses. The participants ages 51-70 years took the highest doses of folate (combined food and supplement), with 5% exceeding the tolerable upper intake level. Two groups were most likely to consume inadequate folate (below the recommended dietary allowance): women of childbearing age (17-19%) and non-Hispanic black women (23%). The study authors concluded that efforts need to be made both to monitor for over-supplementation in certain groups and to target increased supplementation in the groups at risk for deficiency. It is particularly concerning that the groups who are over-supplementing are among the highest risk for accelerating the growth of malignancy through overuse of folic acid, while many in the groups that are under-supplementing are women who could confer benefits of folic acid supplementation to a developing fetus. Clearly, folic acid supplementation continues to be an important primary care and public health issue. Casey et al examined the effects over 1 year of a free weekly iron-folic acid supplementation and deworming program in 52,000 Vietnamese women of childbearing age. The investigators collected demographic data and blood and stool samples at baseline and at 3 and 12 months following the implementation of the program. Findings included a mean Hb increase of 9.6 g/L (P< 0.001) and a reduction in the presence of anemia from 37.5% of the women at baseline to 19.3% at 12 months. Iron deficiency was also reduced, from 22.8% at baseline to 9.3% by 12 months, as well as hookworm infection (76.2% at baseline to 23.0%) in the same period. Folate deficiency can cause anemia. The presentation typically consists of macrocytosis and hypersegmented polymorphonuclear leukocytes (PMNs). More detailed laboratory findings are discussed in the Workup section. The anemia usually progresses over several months, and the patient typically does not express symptoms as such until the hematocrit level reaches less than 20%. At that point, symptoms such as weakness, fatigue, difficulty concentrating, irritability, headache, palpitations, and shortness of breath can occur. Furthermore, heart failure can develop in light of high-output cardiac compensation for the decreased tissue oxygenation. Angina pectoris may occur in predisposed individuals due to increased cardiac work demand. Tachycardia, postural hypotension, and lactic acidosis are other common findings. Less commonly, neutropenia and thrombocytopenia also will occur, although it usually will not be as severe as the anemia. In rare cases, the absolute neutrophil count can drop below 1000/mL and the platelet count below 50,000/mL. Folate in the 5-methyl THFA form is a cosubstrate required by methionine synthase when it converts homocysteine to methionine. As a result, in the scenario of folate deficiency, homocysteine accumulates. Several recent clinical studies have indicated that mild-to-moderate hyperhomocystinemia is highly associated with atherosclerotic vascular disease such as coronary artery disease (CAD) and stroke. In this case, mild hyperhomocystinemia is defined as total plasma concentration of 15-25 mmol/L and moderate hyperhomocystinemia is defined as 26-50 mmol/L. Elevated homocysteine levels might act as an atherogenic factor by converting a stable plaque into an unstable, potentially occlusive, lesion. Wang et al found that in patients with acute coronary syndromes, levels of homocysteine and monocyte chemoattractant protein-1 (MCP-1) were significantly higher. MCP-1 is a chemokine characterized by the ability to induce migration and activation of monocytes and therefore may contribute to the pathogenesis of CAD. Homocysteine is believed to have atherogenic and prothrombotic properties via multiple mechanisms. Bokhari et al found that among patients with CAD, the homocysteine level correlates independently with left ventricular systolic function. The mechanism is unknown, but it may be due to a direct toxic effect of homocysteine on myocardial function separate from its effect on coronary atherosclerosis. Although the exact mechanism is not understood, a relative folate shortage may exacerbate an underlying genetic predisposition to neural tube defects. In a prospective observational study in Norway, where food is not fortified with folic acid, lack of supplementation with folic acid from 4 weeks before to 8 weeks after conception was associated with increased risk of severe language delay in the child at age 3 years. No association between folic acid supplementation and gross motor skills was reported. More recently, a number of studies have demonstrated that folic acid supplementation can actually increase the risk of cancer. The debate over the safety of widespread folic acid supplementation will certainly continue in the medical literature in the years to come. Care should be taken to ensure that individuals do not consume a greater-than-recommended dietary allowance of folic acid, and special consideration should be given to patients with history of colorectal adenomas and those at high risk for cancer. Mechanistically speaking, current theory proposes that folate is essential for synthesis of S- adenosylmethionine, which is involved in numerous methylation reactions. This methylation process is central to the biochemical basis of proper neuropsychiatric functioning. Pregnant women are at higher risk of developing folate deficiency because of increased requirements. Bailey RL, Dodd KW, Gahche JJ, Dwyer JT, McDowell MA, Yetley EA. Total folate and folic acid intake from foods and dietary supplements in the United States: 2003-2006. Am J Clin Nutr. 2010 Jan. 91(1):231-7. [Medline]. Huang T, Chen Y, Yang B, Yang J, Wahlqvist ML, Li D. Meta-analysis of B vitamin supplementation on plasma homocysteine, cardiovascular and all-cause mortality. Clin Nutr. 2012 Aug. 31(4):448-54. [Medline]. Huo Y, Qin X, Wang J, Sun N, Zeng Q, Xu X. Efficacy of folic acid supplementation in stroke prevention: new insight from a meta-analysis. Int J Clin Pract. 2012 Jun. 66(6):544-51. [Medline]. Hankey GJ. B vitamins for stroke prevention. Stroke Vasc Neurol. 2018 Jun. 3 (2):51-58. [Medline]. [Full Text]. Surén P, Roth C, Bresnahan M, et al. Association between maternal use of folic acid supplements and risk of autism spectrum disorders in children. JAMA. 2013 Feb 13. 309(6):570-7. [Medline]. Correa A, Gilboa SM, Botto LD, Moore CA, Hobbs CA, Cleves MA. Lack of periconceptional vitamins or supplements that contain folic acid and diabetes mellitus-associated birth defects. Am J Obstet Gynecol. 2012 Mar. 206(3):218.e1-13. [Medline]. Cantarella CD, Ragusa D, Giammanco M, Tosi S. Folate deficiency as predisposing factor for childhood leukaemia: a review of the literature. Genes Nutr. 2017. 12:14. [Medline]. [Full Text]. Enderami A, Zarghami M, Darvishi-Khezri H. The effects and potential mechanisms of folic acid on cognitive function: a comprehensive review. Neurol Sci. 2018 Jun 23. [Medline]. Ebbing M, Bonaa KH, Nygard O, Arnesen E, Ueland PM, Nordrehaug JE. Cancer incidence and mortality after treatment with folic acid and vitamin B12. JAMA. 2009 Nov 18. 302(19):2119-26. [Medline]. Figueiredo JC, Grau MV, Haile RW, Sandler RS, Summers RW, Bresalier RS. Folic acid and risk of prostate cancer: results from a randomized clinical trial. J Natl Cancer Inst. 2009 Mar 18. 101(6):432-5. [Medline]. Lubecka-Pietruszewska K, Kaufman-Szymczyk A, Stefanska B, Fabianowska-Majewska K. Folic acid enforces DNA methylation-mediated transcriptional silencing of PTEN, APC and RARbeta2 tumour suppressor genes in breast cancer. Biochem Biophys Res Commun. 2013 Jan 11. 430(2):623-8. [Medline]. Hirsch S, Sanchez H, Albala C, de la Maza MP, Barrera G, Leiva L. Colon cancer in Chile before and after the start of the flour fortification program with folic acid. Eur J Gastroenterol Hepatol. 2009 Apr. 21(4):436-9. [Medline]. Mason JB, Dickstein A, Jacques PF, Haggarty P, Selhub J, Dallal G. A temporal association between folic acid fortification and an increase in colorectal cancer rates may be illuminating important biological principles: a hypothesis. Cancer Epidemiol Biomarkers Prev. 2007 Jul. 16(7):1325-9. [Medline]. Cole BF, Baron JA, Sandler RS, Haile RW, Ahnen DJ, Bresalier RS. Folic acid for the prevention of colorectal adenomas: a randomized clinical trial. JAMA. 2007 Jun 6. 297(21):2351-9. [Medline]. Institute of Medicine. Food and Nutrition Board. Dietary reference intakes: thiamine, riboflavin, niacin, vitamin B6, folate, vitamin b12, pantothenic acid, biotin and choline. Washington DC: National Academy Press; 1998. Pfeiffer CM, Caudill SP, Gunter EW, Osterloh J, Sampson EJ. Biochemical indicators of B vitamin status in the US population after folic acid fortification: results from the National Health and Nutrition Examination Survey 1999-2000. Am J Clin Nutr. 2005 Aug. 82(2):442-50. [Medline]. Pieroth R, Paver S, Day S, Lammersfeld C. Folate and Its Impact on Cancer Risk. Curr Nutr Rep. 2018 Sep. 7 (3):70-84. [Medline]. Matejcic M, de Batlle J, Ricci C, Biessy C, Perrier F, et al. Biomarkers of folate and vitamin B12 and breast cancer risk: report from the EPIC cohort. Int J Cancer. 2017 Mar 15. 140 (6):1246-1259. [Medline]. European Surveillance of Congenital Anomalies. Folic Acid. eurocat-network.eu. Available at http://www.eurocat-network.eu/preventionandriskfactors/folicacid. Accessed: September 14, 2018. Noor RA, Abioye AI, Ulenga N, Msham S, Kaishozi G, Gunaratna NS, et al. Large -scale wheat flour folic acid fortification program increases plasma folate levels among women of reproductive age in urban Tanzania. PLoS One. 2017. 12 (8):e0182099. [Medline]. [Full Text]. Casey GJ, Phuc TQ, Macgregor L, et al. A free weekly iron-folic acid supplementation and regular deworming program is associated with improved hemoglobin and iron status indicators in Vietnamese women. BMC Public Health. 2009 Jul 24. 9:261. [Medline]. [Full Text]. Chang JY, Wang YP, Wu YC, Cheng SJ, Chen HM, Sun A. Hematinic deficiencies and anemia statuses in oral mucosal disease patients with folic acid deficiency. J Formos Med Assoc. 2015 Sep. 114 (9):806-12. [Medline]. Genest JJ Jr, McNamara JR, Salem DN, Wilson PW, Schaefer EJ, Malinow MR. Plasma homocyst(e)ine levels in men with premature coronary artery disease. J Am Coll Cardiol. 1990 Nov. 16(5):1114-9. [Medline]. Coull BM, Malinow MR, Beamer N, Sexton G, Nordt F, de Garmo P. Elevated plasma homocyst(e)ine concentration as a possible independent risk factor for stroke. Stroke. 1990 Apr. 21(4):572-6. [Medline]. Wang G, Mao JM, Wang X, Zhang FC. Effect of homocysteine on plaque formation and oxidative stress in patients with acute coronary syndromes. Chin Med J (Engl). 2004 Nov. 117(11):1650-4. Bokhari SW, Bokhari ZW, Zell JA, Lee DW, Faxon DP. Plasma homocysteine levels and the left ventricular systolic function in coronary artery disease patients. Coron Artery Dis. 2005 May. 16(3):153-61. [Medline]. Lonn E, Yusuf S, Arnold MJ, et al. Homocysteine lowering with folic acid and B vitamins in vascular disease. N Engl J Med. 2006 Apr 13. 354(15):1567-77. [Medline]. Bonaa KH, Njolstad I, Ueland PM, et al. Homocysteine lowering and cardiovascular events after acute myocardial infarction. N Engl J Med. 2006 Apr 13. 354(15):1578-88. [Medline]. Ray JG, Laskin CA. Folic acid and homocyst(e)ine metabolic defects and the risk of placental abruption, pre-eclampsia and spontaneous pregnancy loss: A systematic review. Placenta. 1999 Sep. 20(7):519-29. [Medline]. Wolff T, Witkop CT, Miller T, Syed SB. Folic acid supplementation for the prevention of neural tube defects: an update of the evidence for the U.S. Preventive Services Task Force. Ann Intern Med. 2009 May 5. 150(9):632-9. [Medline]. Honein MA, Paulozzi LJ, Mathews TJ, Erickson JD, Wong LY. Impact of folic acid fortification of the US food supply on the occurrence of neural tube defects. JAMA. 2001 Jun 20. 285(23):2981-6. [Medline]. Roth C, Magnus P, Schjolberg S, et al. Folic acid supplements in pregnancy and severe language delay in children. JAMA. 2011 Oct 12. 306(14):1566-73. [Medline]. Gatof D, Ahnen D. Primary prevention of colorectal cancer: diet and drugs. Gastroenterol Clin North Am. 2002 Jun. 31(2):587-623, xi. [Medline]. Blount BC, Mack MM, Wehr CM, et al. Folate deficiency causes uracil misincorporation into human DNA and chromosome breakage: implications for cancer and neuronal damage. Proc Natl Acad Sci U S A. 1997 Apr 1. 94(7):3290-5. [Medline]. [Full Text]. Kim YI, Pogribny IP, Basnakian AG, et al. Folate deficiency in rats induces DNA strand breaks and hypomethylation within the p53 tumor suppressor gene. Am J Clin Nutr. 1997 Jan. 65(1):46-52. [Medline]. Burr NE, Hull MA, Subramanian V. Folic Acid Supplementation May Reduce Colorectal Cancer Risk in Patients With Inflammatory Bowel Disease: A Systematic Review and Meta-Analysis. J Clin Gastroenterol. 2017 Mar. 51 (3):247-253. [Medline]. Nutrition classics. Transactions of the Association of American Physicians, volume 75, 1962, pages 307-320. Experimental nutritional folate deficiency in man. by Victor Herbert. Nutr Rev. 1982 Aug. 40 (8):246-8. [Medline]. Kado DM, Karlamangla AS, Huang MH, et al. Homocysteine versus the vitamins folate, B6, and B12 as predictors of cognitive function and decline in older high-functioning adults: MacArthur Studies of Successful Aging. Am J Med. 2005 Feb. 118(2):161-7. [Medline]. Adunsky A, Arinzon Z, Fidelman Z, Krasniansky I, Arad M, Gepstein R. Plasma homocysteine levels and cognitive status in long-term stay geriatric patients: a cross-sectional study. Arch Gerontol Geriatr. 2005 Mar-Apr. 40(2):129-38. [Medline]. McMahon JA, Green TJ, Skeaff CM, Knight RG, Mann JI, Williams SM. A controlled trial of homocysteine lowering and cognitive performance. N Engl J Med. 2006 Jun 29. 354(26):2764-72. [Medline]. Braun KV, Voortman T, Kiefte-de Jong JC, Jaddoe VW, Hofman A, Franco OH, et al. Dietary Intakes of Folic Acid and Methionine in Early Childhood Are Associated with Body Composition at School Age. J Nutr. 2015 Sep. 145 (9):2123-9. [Medline]. Reynolds EH. The neurology of folic acid deficiency. Handb Clin Neurol. 2014. 120:927-43. [Medline]. Shiraishi M, Haruna M, Matsuzaki M, et al. Association Between Oxidized LDL and Folate During Pregnancy. Biol Res Nurs. 2013 Apr. 15(2):213-8. [Medline]. The chemical structure of folic acid and amethopterin (methotrexate), a folic acid antagonist, shows the similarity of structure. The transformation of formiminoglutamic acid to glutamic acid is dependent upon both vitamin B-12 and tetrahydrofolate. In contrast, the transformation of homocysteine to methionine is a vitamin B-12–dependent reaction. Histologically, the megaloblastosis caused by folic acid deficiency cannot be differentiated from that observed with vitamin B-12 deficiency. Peripheral smear of blood in a patient with pernicious anemia. Macrocytes are observed and some of the red blood cells show ovalocytosis. A 6-lobed polymorphonuclear leucocyte is present. Bone marrow aspirate from a patient with untreated pernicious anemia. Megaloblastic maturation of erythroid precursors is shown. Two megaloblasts occupy the center of the slide with a megaloblastic normoblast above. The authors and editors of Medscape Reference gratefully acknowledge the contributions of previous coauthor Ahmed Mosalem, MD, to the development and writing of this article. The authors and editors of Medscape Reference also gratefully acknowledge the contributions of previous coauthors Subir Vij, MD, MPH and Waleed Siddiqi, MD to the development and writing of this article.